Pijl is a lovely unisex hat with stranded color work. With only two colors, this hat knits up super quick. Due to the simple colorwork design, it is also a great first stranded project for anyone who has never attempted this technique before. This pattern contains instructions for a whopping 9 sizes, ranging from Preemie to Adult Large. The Pijl hat is completely seamless and knitted from the bottom up. 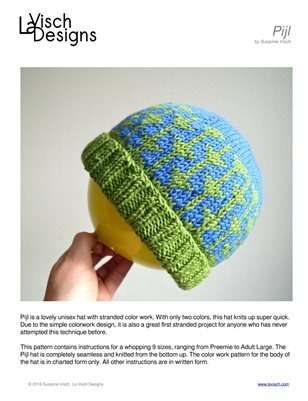 The color work pattern for the body of the hat is in charted form only. All other instructions are in written form.